Hud Driven 10 colors customizable top, pants, bottons. They are only 99L during this round and there is also a gift out for you! 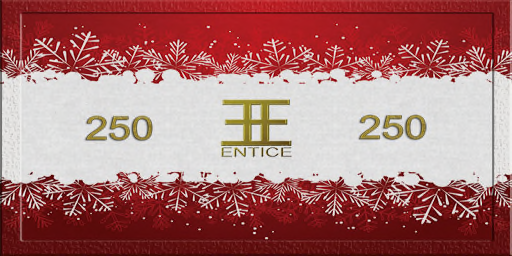 Entice - The Makeover Room Event - Last Day!! Decorative Christmas Table. 03 prims. Gift for the FABFREE group. Wear your FABFREE tag! in 4 lovely colors and black pants. They can be worn separate. The new group gift for December is up for you. A cute, cozy sweater with 6 beautiful colors and holiday graphics. And of course a new raffle, 150L gift card and Lucky chairs. *Armonia Decor & Events* PACKAGE CHRISTMAS. Tres colores: Rojo, blanco y verde. Flor Ornamental decorativo 01 prims. MOoH! is offering a lovely knit maxi sweater in 18 beautiful colors per hud. They are just 99L during the fair. I've also put a lovely warm gift up for you!